Pollution of the open seas by human activities has become a serious problem. 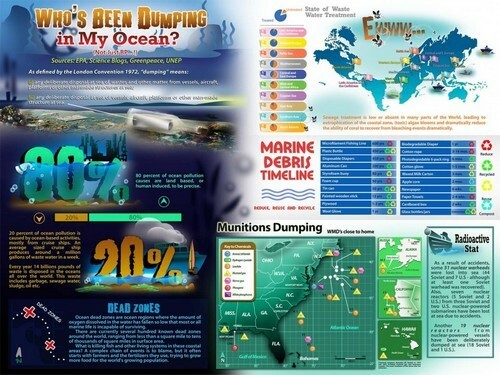 Ocean dumping is the dumping or placing of materials in designated places in the ocean, often on the continental shelf. A wide range of materials is involved, including garbage, construction and demolition debris, sewage sludge, dredge material, and waste chemicals. In some cases, ocean dumping is regulated and controlled, while some dumping occurs haphazardly by ships and tankers at sea, or illegally within coastal waters. Incineration at sea of organic wastes, with subsequent dumping, has been allowed as a viable disposal process, both in the United States and in Europe.